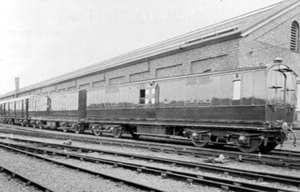 During the First World War, the people of Wolverton and surrounding area had the opportunity to view the new Ambulance Train, built in the Railway Works, which would be used in France. The train was on view to the public in the Carriage Works at Wolverton from 2pm to 5.30pm on Saturday 25th March 1916 at a charge of 6d per person, with the money collected being added to the Works Relief Fund. The Wolverton Works War Relief fundraised £73.9s.1Od. (£73.49p) in 3.5 hours from the public viewing. The pharmacy car will perhaps attract as much attention as any on the train. 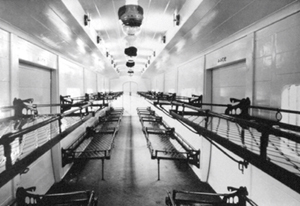 It includes a medical comforts’ stores, an office for the Officer Commanding with safe, writing desk and other fittings, a treatment room (zinc lined)’with operating table, appliances etc., a fully equipped dispensary and a linen store. 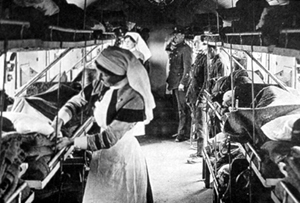 LNWR WW1 Ambulance Trains are very fully described in my booklet “LNWR Great War Ambulance Trains” (46 pages) published by the LNWR Society as Premier Portfolio No.11.